80% of vitamin B1, vitamin B3 70%, 90% vitamin B6, 50% phosphorus (P), 60% of substance iron (Fe), 100% fiber and fatty acids essential. Fulfill the 50% requirement of manganese (Mn) per day. Fulfill the 21% requirement of Magnesium (Mg) and Calcium (Ca). 14% meet their daily fiber needs. Contains selenium for mineral anti-oxidants. Essential fatty acids can lower cholesterol. Contains fiber, Mg and vitamin B. The color is brown, fragrant and taste very typical, like sticky rice. Brown rice is rice is not milled or semi-ground, so it can be said to have taste a bit like nuts and more chewy instead of white rice. Although more stale fast, but more nutritious brown rice. Differences Brown Rice and White Rice Actually between brown rice and rice plain white is not too much different. Difference between the two lies in the processing and nutritional content. If the outer layer or skin ari / chaff from the grain shelled the result is brown rice. However, if the inner layer or bran is also removed, then the result is plain white rice. 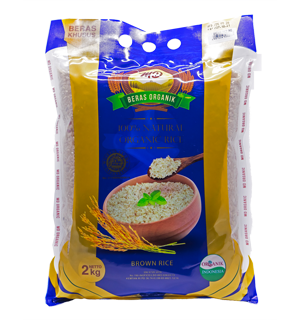 One dose of brown rice: Some types of vitamins and minerals will lost in the process of grinding grain. As a result, some nutrients are lost such as vitamins B1, B3, and iron are often added on white rice so labeled "Enriched". While the brown rice, a type of mineral that is not need to be added are magnesium.